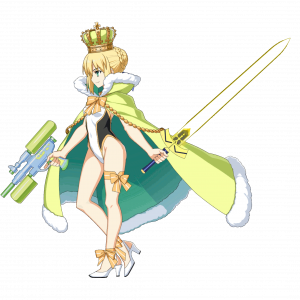 This article is for the 5★ , Altria Pendragon . 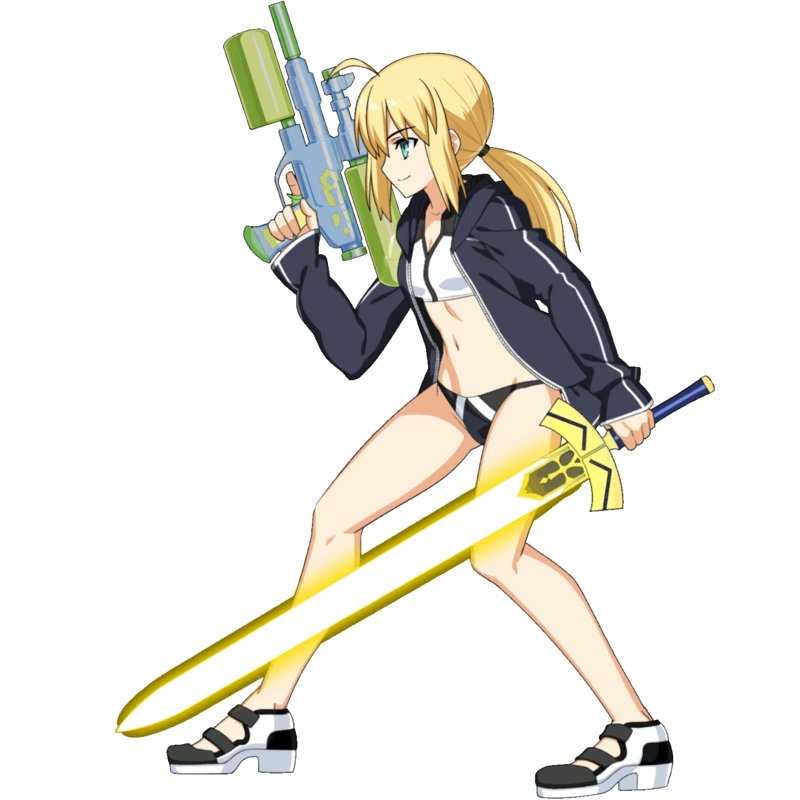 For the 5★ , see Altria Pendragon; for the 5★ , see Altria Pendragon (Lancer). Reduce own NP gauge by 10%. Overcharge: Restore own NP gauge. The King of the Beach has descended upon the summer ocean. She has left all her kingly duties behind at the office, and has come fully prepared for the summer sunshine. Due to certain circumstances, Altria was unable to enjoy swimming. She entertained herself with watermelon splitting on the beach... Until she met Water Blitz (paintball using water guns). The next thing you know, she looked like this. Since she hates losing, the only goal she has right now is to become the World Champion of this game. ...On that day, she encountered a certain fate (though she does not really care too much). I'm an Archer-class, of course. Do you have a problem? 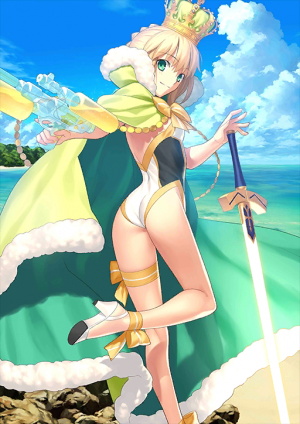 She's the usual Altria, but she's a bit more relaxed since she's at the beach. She still feels like she's a leader, but it's obvious that she's calmer than usual. She thinks it's a good idea to let loose, given that she's on vacation. 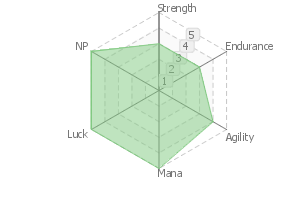 Whether it be sports or games, as she hates to lose, she'll always aim for the seat of strongest of the Archer-class. Sword of Radiant Sunlight Victory. Despite saying all that about Archer-class, this is how it turned out in the end. Yeah, really childish. "Excalibur was originally entrusted to me by the fairy of the lake, so why would it be surprising if it had water attributes of some kind?" Even Aggy would have to hold back a smirk at that one. A skill unique to her that restores HP in exchange for NP. She's revered as the "King of Food" by most of the food shops along the beach. It is said that her lavish orders, exuberant eating, and shining smiles after meals will bring a shop prosperity. Maybe. Probably. But she definitely isn't eating any mashed potatoes. A king of the beach that descended on the summer sea. 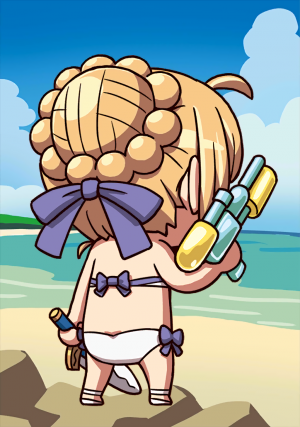 Since all the duties as a king were left behind at the office in this occasion, she is completely adapting to the summer's sunlight. 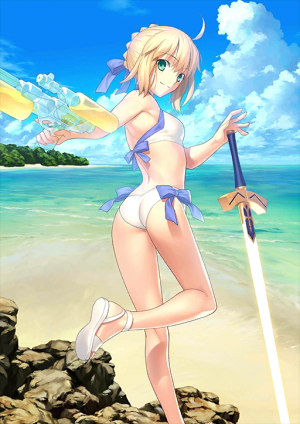 As she was not able to fully enjoy swimming due certain circumstances, Artoria was having fun with watermelon splitting at the beach when she met the water blitz (a survival game using water guns), and turned out like this by the time anyone noticed. It goes without saying that she, who hates to lose, is aiming at becoming world champion. ---at that day, she met her (relatively trivial) fate. I'm an Archer Class, of course. Do you have a problem? 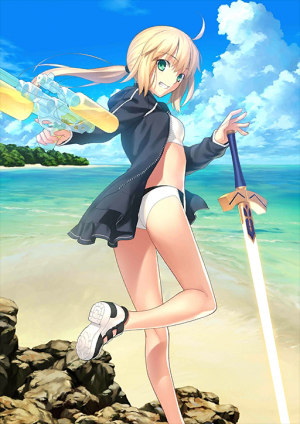 The same Artoria as always, but her attention is just a little more relaxed since this is the beach. Her class representative temperament has not changed, but it goes without saying that she is more gentle than usual. In this rare vacation, it should be fine to cut loose at least this time around - such is her stance. Also, one should play at the playtime. Wherever it is games or sports, she - who hates to lose - is aiming at the seat of strongest of the Archer Class. Excalibur Vivian. Despite saying all that about Archer Class, it turns out like this in the end. Indeed, how childish. "Still, Excalibur was originally something entrusted by the fairy of the lake, so there shouldn't be anything weird even if it possessed the water-attribute". Even Ak-kun would have a strained laugh at that. A Personal Skill that restores HP in compensation for NP. While at the beach, she is revered by most food stalls as the "king of foods". It is probably due her lavish orders, pleasant eating spectacles, and the shining smiles after meals that cause said shop to flourish - or so it has been told. Is it really? Maybe it is. Originally a Skill from the Caster Class. A dream-like effect by means of the protection of the fairy, which boosts the morale of companions, raises LCK, raises accuracy rate, clears irritation and, on top of that, makes them refreshed. A cheat Skill in regards to survival games. 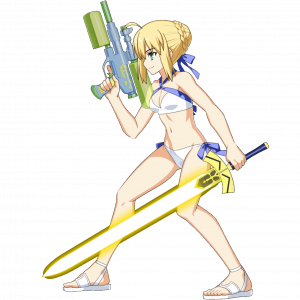 By displaying this Skill, Artoria will become the champion of the world tournament of water blitz, but that is another story. Who said that King Arthur was a sword-only Heroic Spirit? She also uses a sword. She also uses a spear. She also uses a bow. She also rides a reindeer and makes surprise attacks on her Saber kins. As expected, wouldn't you call this an almighty combat skill befitting the King of Knight's reputation? She has an unique skill animation when activating Protection of the Beach House. "Vivian" is the name for the Lady of the Lake. This page was last modified on 18 August 2018, at 18:49.